I was so glad Debbie asked me to be a part of her home tour series. Debbie and I go way back to the days of rate my space. In fact I can blame thank Debbie for pushing me to start my blog. I love looking at other people’s homes. My home doesn’t stay the same for very long since I am always changing things ups a bit. Here are a few pictures of our home. Some are new and some I pulled from past posts so not all these rooms look exactly like this now. I told you I change things a lot. For a little history about our house. Mr. Savvy and I designed and built it in 1995 doing much of the work ourselves while working full time jobs. We moved in six months after starting construction. Many things have been changed over the years. The wood flooring was installed several years ago and we had the kitchen updated, too. All the colors in the house and outside have changed of course along with the ever revolving decor. The Tennessee fieldstone on the outside was added a few years ago. That was a huge change. The roof was a greenish gray when we built, but had to be replaced over a year ago after having hail damage so I switched to a brown to go better with the colors in the rock. WELCOME Kim from Savvy Southern Style! To the left is the sitting room filled with hunt scenes, dog prints, and vintage leather books. I still love this horse sign that I bought from Ethan Allen when it went on sale. Across from the sitting room is the dining room. Right off the foyer is the great room or I should say left off. The breakfast room is to the right of the great room. Mr. Savvy just recently added the beadboard wallpaper and trim and I painted it. I love this change. Now let’s visit the heart of our home. This is the view when we come in from our garage. We had our kitchen updated a few years ago. When we built our house I had a totally white kitchen except the walls were wallpapered. We had white cabinets, white counters and white linoleum flooring. Yes, it was bright and white because our first house had a dark galley style kitchen so I went complete opposite on this one. A few years ago we had new door and drawer fronts made and then painted on site by professionals. We then added giallo ornamental granite and we installed the tumbled marble backsplash ourselves. 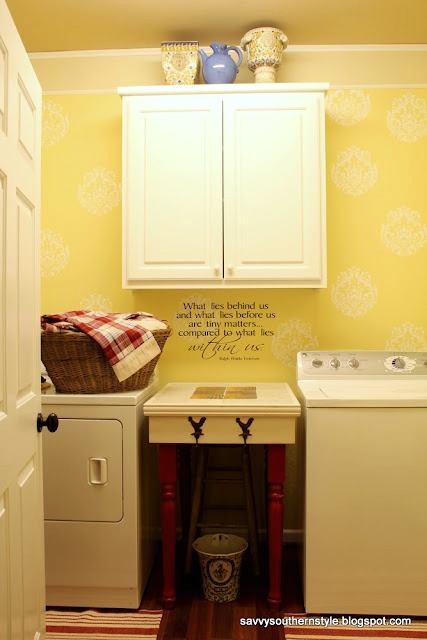 The laundry room was updated this year and it makes it so much nicer to do laundry in. Let’s venture over to the other side of the first floor to the master bedroom. This is the most recent update. This is the master bath, but I have just painted the cabinets and will reveal that soon. The powder room which was recently renovated and featured in Cottages and Bungalows magazine is between the sitting room and the master bedroom in a little hallway that runs between the sitting room and great room. Let’s go upstairs to see the guest rooms. This is the vintage nautical themed room. It is actually going through some small changes now. This is the other guest room on the front of the house. Well, I think that about covers everything except the sunroom. It will be revealed soon so be sure and stop back by for a visit. What a gorgeous and most welcoming home you have. I can say that, because I was there! Thanks again, Debbie. Have a super weekend! Oh Kim I LOVE your home! I’ve seen lots of it already when you’ve shared bits before but it was so nice to see it in one fell swoop! I didn’t know you and your husband worked on the building of the home like we did so that was VERY interesting! I love your decorating style and use of color. It’s always obvious when someone actually LOVES their home and is not just decorating to check a room off their list. A home is always growing and changing and that shows love…..the difference between a house and a home! I have always loved Kim’s home! So great to see it on your home tour. I love going from room to room to see how they all connect. Thanks Kim and Debbie! I love seeing pictures of Kim’s home, Debbie! She has such a great decorating style and always finds such great things to add in. I can’t wait to see her full sunroom reveal. Kim has such a beautiful home! You can tell that her attention to detail is remarkable. Thanks Kim and Debbie! 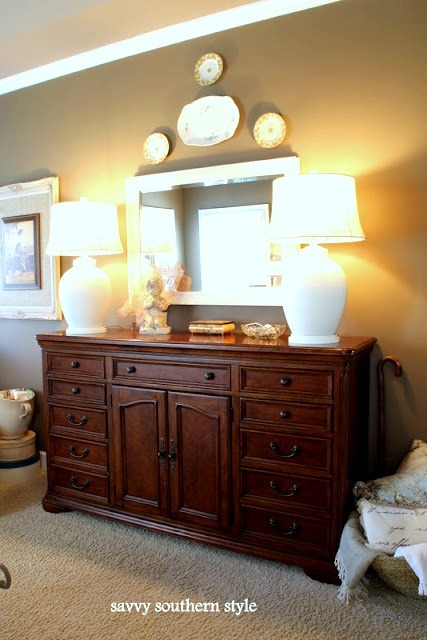 Kim, your home is beautiful, love the powder room! I love your home Kim. It is bright, warm and welcoming! Thanks Debbie for featuring Kim. Thanks for sharing Kim’s home. I bet it it even more fantastic in person than in the photos. I love how it’s constantly evolving. Beautiful! I especially love the dining room and bedroom! touch all over it. The bonus is that we got to watch while some of the beautiful touches too form. It looks so pretty! It’s nice to see everything laid out in one post like this. I’m sure it won’t look like this though this same time next year. ha! It will probably look even better! Thanks, Debbie, for hosting this tour! I loved the tour of Kim’s home. It is amazing! 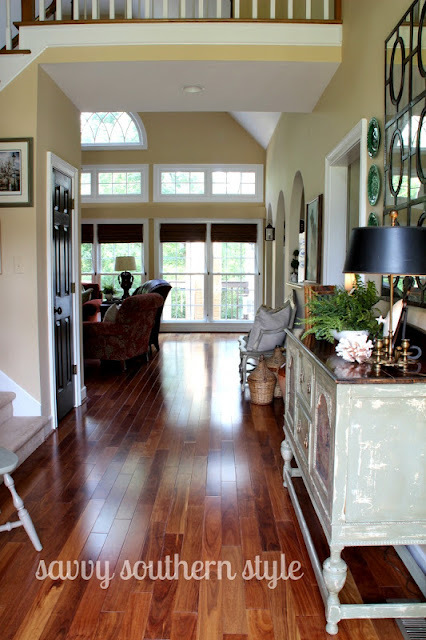 I agree with the others – it is so nice to see the entire home in one post. I can not decide which room I like the most. They are all gorgeous and magazine worthy!!!! Love Kim’s home and love seeing the changes she makes! Looking forward to seeing the sunrooms new look! I think this was the first time I have been in Kim’s kitchen. I couldn’t tell what photos were newer or older of the house since it all looked good. Well ok, maybe I did notice the color of the mantel, she can’t keep her paint brush off that! Thanks for featuring her lovely home. I want to wish Mr. Doos a Happy Father’s Day. Love these home tours! So nice to see everything all at once. This is beautiful and Kim has great taste. You have a beautiful home! I love your dining room chairs and the cow-butchering posters. So cool! One word….A M A Z I N G!!! Thanks for sharing Debbie! Thanks for this beautiful post Debbie, Kim’s home is beautiful. I can’t believe Kim completed construction in 6 months!! Love how she’s always changing things up – she has an amazing home! Debbie, thanks for hosting Kim’s home tour and thanks Kim for showing us everything in all one post. I too, love looking at other people’s homes big or small size doesn’t matter. Your home is gorgeous! I love how you are able to have pots hanging from the ceiling in the kitchen. I’ve always loved that look but my space is too small. Your sitting room, dining room and great room are so interesing. For the outside I love the garage doors and the big beautiful arched window in the front. Thanks Debbie and Kim for the feature. I had a great time touring through your home. Kim’s home is just beautiful! I’ve been following her blog ever since she started and always enjoy seeing all of the changes that she makes. Thank you for featuring her home today. I thought I had seen it all! Love Kim’s home! The copper collection is growing! Looks fabulous! Thanks Debbie, for featuring Kim’s home on the tour. I enjoyed! I never get tired of seeing Kim’s home. Maybe that’s because she’s always changing something……lol! I get lots of “copycat” ideas at her home! Thanks, Debbie, for asking Kim to share her beautiful home. It’s so much fun to get these peeks inside other people’s homes. 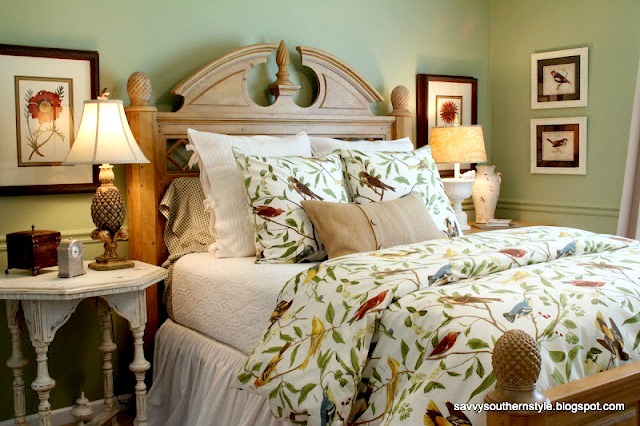 I adore Kim’s home….It is so warm and inviting and her decorating talents shine in each and every room…I love, love her style…and look forward every day to see what incredible thing she has done to her home…. I follow Kim’s blog regularly and I love her house! And thank you for hosting home tours! 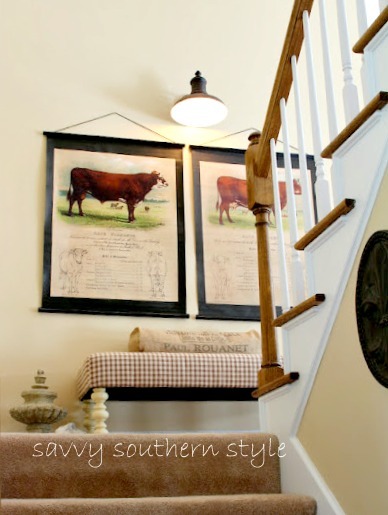 I love to get ideas from seeing someone’s “whole” house and not just a post about a small portion! I love to see all the changes Kim makes. She truly has a Southern style that could be right out of Southern Living. It’s gorgeous! Thanks for the tour Debbie! She has such a wonderful Southern style about her. I was fortunate to get to meet Kim and have dinner during the Haven conference. She is a sweetie and an awesome blogger! Always a treat to visit in Kim’s gorgeous home. I admire Kim’s enthusiasm and energy. She is an amazing lady, not unlike YOU!